Let’s face it, practically all of us set New Year’s resolutions every year, and practically every year they don’t come true. Sure, we work hard on them for a week or two, and sometimes even a month! Slowly but surely, though, we forget all about them and our life returns to the way it was before. This doesn’t mean we should eliminate resolutions all together, because they can certainly be powerful tools in creating change in our lives. 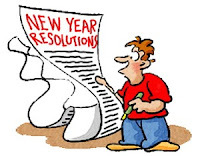 However, I’d like to suggest a different way we could go about setting resolutions this year, which will make them more effective and more likely to come true! 1) Set an intention: Instead of calling them New Year’s resolutions, try calling them New Year’s intentions. Sure, it sounds like the same thing, but there’s a slight difference. So many of us have set resolutions in years past and have been unsuccessful. Therefore, just hearing the word “resolution” has a negative connotation to it. In fact, those people who don’t set New Year’s resolutions say they don’t do it because they know they’re sure to fail! A resolution means you resolve to do something, and therefore if you aren’t successful you automatically assume you’re a failure. By calling it a New Year’s intention instead, you are signaling to yourself and the Universe that you are intending to create a change in your life and will do everything you can to make that change come true. However, because it’s an intention and not a resolution, you don’t have any excuse to beat yourself up if you're not successful. You still may not follow through as much as you would like, but at least you won't be so harsh on yourself! 2) Learn to love yourself: Instead of intending to do the same things you’ve probably tried in years past (like losing weight, quitting smoking, etc. ), why not make this the year you finally learn to love and accept yourself, AS IS, once and for all?! So many people want to create change in their lives because they think that will finally make them happy. Without true self-love, however, you will never achieve the level of happiness and security that you think weight loss, making more money, finding your life partner, etc. will bring you. Start by learning to love yourself once and for all, and not only will you feel better as a whole, but all those other things you are hoping to achieve will manifest much easier in your life! See my last blog post for an exercise that will help you do just this. 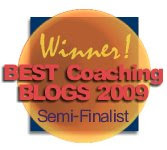 3) Celebrate your successes: Be sure to acknowledge and reward yourself for all the great effort you put forth in 2009 and everything you accomplished, whether you set out to or not. Most people are so focused on what they want to change in 2010 that they completely forget to give themselves credit for what they achieved in 2009! Sit down and make a list of everything that went right in the past year. Celebrate yourself for all the successes you had, no matter how big or small. Not only will this help you reflect on how productive your last year really was, but doing this will fill you with a sense of accomplishment and lots of positive energy and motivation as you head into 2010! 4) Practice gratitude: Finally, be grateful for the resolutions you set in 2009 that didn’t pan out exactly the way you had hoped. There’s always an upside to every situation, and the sooner you can find it the better off you’ll be! Rather than beating yourself up for not having lost that ten lbs. last year, find the payoffs you gained from that situation. For example, maybe you were able to spend more time with your children because you weren’t spending so much time in the gym. Or maybe you didn’t get the job you were hoping for last year, but in turn that allowed you to start a successful online business instead. Even if the payoffs aren’t immediately obvious, keep looking and you’re sure to find them! The Universe always has your best interests in mind, so if you didn’t achieve something last year that you were hoping to it just means there was a bigger and better plan for you. Here's to hoping that 2010 is your best year yet! If I can help you in any way or support you in achieving your dreams, you are always welcome to contact me. 2010: The Year of Self-Love! As 2009 winds down and 2010 is rapidly approaching, I’m sure that everyone is rushing to finish their holiday shopping and trying to come up with resolutions for the year ahead. Instead of setting the same old New Year’s resolutions as the year before, however, and probably the year before that, I’d like to suggest a different sort of resolution for 2010 that most people probably overlook. Instead of planning to finally lose that dreaded last ten lbs., or find your soulmate, or make more money, or quit smoking, etc. why not make 2010 the year you finally learn to love yourself, faults and all and make it the year of self-love?! We’ve all heard that loving yourself is essential if you want to live a truly rewarding life, but how many of us can actually say we love ourselves deep down, exactly as we are. You may have even reached a place where you are able to love and accept yourself most of the time, but there are still a few areas where you are struggling to appreciate yourself day in and day out. Let's make this year where we finally make peace with every single place in ourselves, good, bad, and ugly! Not only will you feel a lot better as a whole, but all those other things you’re hoping to achieve will fall into place so much easier if you just love and accept yourself as you are. Here’s an exercise I tried recently, and it is extremely powerful in getting you to a place of releasing shame and making peace with yourself as a whole. I found it in Byron Katie’s book, I Need Your Love - Is That True? : How to Stop Seeking Love, Approval, and Appreciation and Start Finding Them Instead and instantly recognized its potential and possibilities for increasing self-love. I encourage you to try this, and the more uncomfortable you are with it, the better! First, take out a sheet of paper and think of someone in your life that you hide things from. It could be a spouse, parent, child, friend, etc., or even the planet as a whole! Now, imagine that you are writing a letter to this person (or people) and start out the letter by saying, “What I don’t want you to know about me is…” Then, list everything you would be ashamed of or embarrassed about if that person discovered these aspects about yourself. Things like, “I have cellulite on my thighs, I rarely pay my bills on-time, I can be really evil when someone crosses me, I act like I am holier than thou but usually I’m not, I often say no to plans with friends because I don’t really like them and would prefer to be by myself, etc.” You get the point. Anything you would not want this other person to find out about, include it in your list! This can be an easy or difficult exercise, depending on how much you currently accept yourself and how in touch with your “darker” places you are. Some of you may have several things to list, whereas others of you may just have a few places inside that you haven’t fully come to terms with yet. If uncomfortable feelings come up while you do this exercise (which is completely normal! 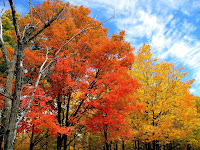 ), then just take some time to simply be with yourself and be with the uncomfortable thoughts and feelings that arise. You may find yourself thinking things like, “I would be horrified if he ever knew that about me! He would leave me in a heartbeat.” or “There’s no way I could ever tell her I did that. She would never look at me the same again.” Simply notice the thoughts passing through your mind and the sensations you feel in your body. You don’t have to do anything with them except notice them. If you meditate then you know the power of watching your thoughts and feelings float by and not getting caught up in them. After you’ve taken some time to simply be with yourself, and with the thoughts and feelings that arise from doing this exercise, I think you’ll feel much more at peace with the aspects of yourself that you previously thought were so unlovable. You may even actually find yourself loving them and appreciating them! 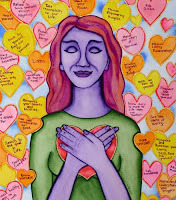 Let's all learn how to love ourselves once and for all, and make 2010 the year of self-love. 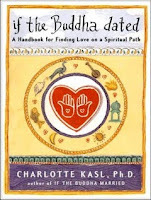 by Charlotte Kasl, which is a great read for anyone trying to introduce more love and spirituality in their life. She has a version for married couples, as well. I’ve been wanting to read this book for awhile now, and I'm glad I picked it up! This is not your typical dating book that describes how to attract someone by acting according to certain rules, dressing a certain way, or playing a particular part. Instead, the basis of this book is that the only way to ever truly attract a genuine spiritual partnership into your life is to love and accept ALL of yourself (yes, even those parts that you don’t particularly like!) and allow your partner to love and accept those sides of yourself as well. With the divorce rate being as high as it is today, I would venture to say that most marriages and relationships are NOT founded on this premise! Instead, relationships are usually more about finding someone to "complete you," to fill up the holes in your life, and to take the blame if you're not happy. What about taking responsibility for your own happiness, though? I’ve been in my fair share of relationships where both of us did our best to show the other person how desirable we were, while blatantly hiding and denying any “negative” characteristics of ourselves that might find their way into the relationship. And if we did ever expose any “dark” sides of ourselves, it certainly wasn’t our fault! It was always the other person’s fault for causing us to act in such an ugly way. Ultimately, though, relationships like these never work because sooner or later the less-than-perfect aspects of ourselves always show up, whether we like it or not. At that point, either person A begins to run away so person B doesn’t see their "dark" places, or person B pulls away because they are uncomfortable with the dark places person A is showing (not accepting, of course, that they have their own dark places as well!). I’ve known since I was a very little girl that I don’t want just any marriage. I want a deeply spiritual, life partnership, in which I am free to be me, ALL of me. Obviously, this also means that I will support my partner in being all that he is, good, bad, and ugly! Sure, we’d all love to live in a perfect world where we're always happy, constantly loving and kind, faithfully living our true purpose, etc., but most of us are not living in that world on a daily basis, myself included. I have very up days, and I also have very down days, very scared days, and very angry days. I’d love to have a partner who sticks by my side and supports me, even on the “off” days. Personally, I find it very attractive when a man can admit he’s scared or feeling weak or powerless, no matter how macho he may appear on the outside! In light of the recent Tiger Woods saga, it seems especially important to remember what’s important in keeping a solid relationship together. Even with all the money in the world, good looks, unmatched career success, and a beautiful wife and kids at home, Tiger’s life and marriage is obviously not all it’s cracked up to be. I wonder how much of his situation comes from a reluctance to show and admit weaker sides of himself because he's trying so desperately to present an image of perfection to the world. I definitely remember seeing photos of his wedding and thinking to myself, "Wow, he really has it all!" It seems that in his quest to uphold his image of a perfect life, something went seriously wrong. It takes a lot to open up to those parts in ourselves that may be particularly scary or painful. In fact, some of us may have hidden those parts of ourselves so deeply inside that we begin to uncover emotional scars still lurking from when we were five years old! It can be a bit startling to realize that something that happened to you when you were five years old is sabotaging your current relationships. The trick is in learning to practice compassion and kindness for yourself, and accepting yourself for being human. 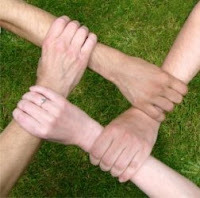 We all have good points and bad points, strengths and weaknesses, and successes and failures. Learning to make friends with all the various places in yourself and accepting them will not only allow you to develop a much stronger relationship with yourself, but will help you in attracting a spiritual partner who will also love you for all your good points and bad points! 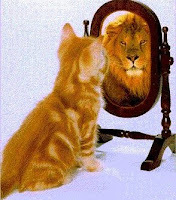 Let me ask you a question: How do you see yourself? No, I don’t mean when you look in the mirror or see a picture of yourself (despite the picture above! ), but when you really look inside and see yourself in your mind's eye. 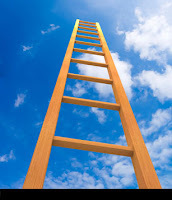 If you were able to look down upon yourself from somewhere up in the sky, would you see yourself as happy, elated, and living the life of your dreams? Or do you see someone who’s angry, miserable, and can never catch a break? How you answer that question has a lot to do with the current circumstances of your life and the results you experience on a day-to-day basis! If you see yourself as someone who always succeeds and makes things work, then you’re probably more open to taking risks and have a way of making things happen in your life. However, if you see yourself as more of a victim for whom things never work out, then you’re probably less likely to take chances or if you do, you might subconsciously sabotage yourself so that things always end up looking like a failure. Find a quiet spot where you can sit or lie quietly undisturbed for a few minutes. Take a few deep breaths, and allow yourself to completely relax and release all tension from your body. Next, imagine yourself flowing out of your body and looking down upon yourself from somewhere up in the sky. Just use your imagination for this, and pretend that you can look down on yourself. Pick a few different scenes from your daily life and observe yourself from above. What do you see? Are you happy and filled with joy as you go about your life, or sad and lonely? Are you open and welcoming to others, or closed off and hiding behind layers of emotional walls? How do you look and act in different scenarios and surrounded by different people? Be sure to “observe yourself” from above especially in those areas where you regularly experience difficulties in life, i.e. work, relationships, family, etc. Remember, whatever vibe or energy we send out into the world is multiplied by the law of attraction and creates the results we experience in our lives. If you’ve been having difficulty with a particular situation for awhile now, see if this exercise helps you see what vibe you are sending out to the Universe. Sometimes the way we are seen by others and the Universe as a whole is completely different than how we perceive ourselves (both in good ways and in bad!). David Cameron Gikandi says, “Life is images of the mind, expressed. What this means is that Life, The Source, uses your thoughts, your mental images, as the instructions by which to create your reality in the material world. Life expresses your mental images into physical reality.” Whatever you are focused on in your mind and how you see yourself determines what you create in your existence. The good news is, if you don’t like the way you see yourself or if your self-image doesn't line up with what you are trying to create in life, you can easily change it! Instead of seeing yourself as someone who can never make a relationship work, hates their job, and can never get ahead financially, use the power of your imagination to see yourself as someone who is married to your perfect partner, succeeding in your dream career, and making more than enough money to take vacations to exotic locales (or whatever appeals to you). For even faster results, visualize yourself living your ideal life for 15 minutes a day and in no time at all you'll be living a brand new life! 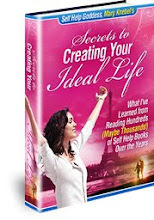 To learn more about the power of visualization be sure to check out my ebook, Secrets to Creating Your Ideal Life. You will learn why visualization is so crucial in creating a life that makes you excited to jump out of bed every single morning! One of my favorite techniques for creating my ideal life and making things happen is keeping an evidence journal (see #7). 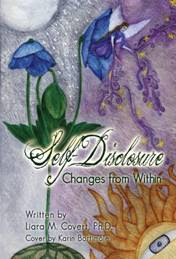 This is a journal in which you record evidence that whatever it is you are desiring is on its way to you. Not only does this help you keep your thoughts and feelings positive and in a good vibration, but it also speeds up your manifestation because it keeps you focused on what you are trying to create! I have so much fun keeping evidence journals that awhile back I decided to create an evidence journal with a twist... 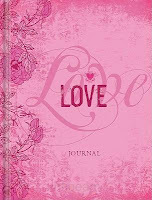 I started keeping a love journal! Instead of listing all the evidence that a particular goal or thing is on its way to me, I list all the ways I am loved. And let me tell you, I have more love in my life than I ever realized! Although you can certainly list ways that you feel loved by your significant other, you also want to focus on other ways you feel loved in general. Have fun with this and really let your imagination run wild with all the various ways you are loved. You can list ways you feel loved by individual people, your pets, random strangers, the Universe, God or your Higher Power, life as a whole, etc. • That person at the bank let me go in front of them today. • My significant other brought flowers home unexpectedly. • My dog gave me sloppy kisses at the end of the day. • I got a raise and promotion at work! • I allowed myself to indulge in a warm bubble bath after work. • I didn't beat myself up for missing my workout this morning. • I did the mirror exercise every day this week. Again, really allow yourself to get creative with all the different ways you are loved. Also, feel free to decorate the cover of your journal if it helps you get in the spirit! Keep doing this exercise regularly and I think you will be astonished by how loved you really are, no matter what is currently going on in your life! This is a bit of a follow-up to the last post I wrote, but it’s such an important topic that I figure we can never get enough of it! I’m reading a good book right now called Real Love: The Truth About Finding Unconditional Love & Fulfilling Relationships, which came highly recommended by a friend of mine. I’m only about halfway through it, but so far I’ve really resonated with one of the concepts in it: that of being seen, or telling the truth about yourself and who you are. The premise of the book, at least from what I’ve read so far, is that the lack and emptiness that most of us feel in our lives comes from an absence of being unconditionally loved. Deep down, what we are all craving is a deep sense of unconditional love and acceptance, for being exactly who we are. Problem is, most of us have never experienced this because our society is not really set up this way. Instead, we are usually taught to hide who we really are in order to achieve success as society has determined for us. The author of the book, Greg Baer, says that being seen is one of the ways of finally obtaining this elusive unconditional love that we are all seeking. Being seen means expressing the truth of who you are, without fear of rejection or concern for what other people will think of you. It means authentically being who you are deep down, even when telling your truth might not be the easiest or most comfortable thing to do. The author says that in order to feel unconditionally loved, you have to express yourself, ALL of yourself, and ultimately be loved and accepted, even for those parts of yourself that may make you seem flawed or less than perfect. His point is that by showing these parts of yourself that you normally don't let others see, there will inevitably be people in your life who will love you, in spite of these "flaws," and then you will not be ashamed of these aspects of yourself anymore. Instead, you will feel unconditionally loved! I really like the quote at the top of this post because for me it represents what it means to truly be seen and to show yourself to others. Who you are should radiate from you so much that people can get a real sense of you, without even asking! If someone were to meet you and spend just five minutes with you, could they get a good sense of who you are and what you are about? Even if you can't discover specific details about someone in five minutes, you can usually tell if they are happy, angry, friendly, joyful, annoyed, optimistic, hopeful, etc., just by the way they carry themselves. Are you expressing who you truly are on a daily basis? 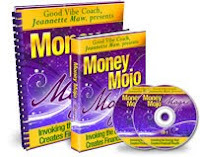 I know before I started my www.selfhelpgoddess.com website, I was definitely not authentically expressing myself! I was expressing part of who I am, but there was this whole other side of me that I was basically hiding from others. I had never really met others with such a deep interest in personal growth, so I just didn’t bring it up in conversations or share that part of myself with friends. I took my first step towards really being seen last year when I went to the Breakthrough to Success conference with Jack Canfield. I had no idea what to expect, but I was so surprised when I discovered that there are a TON of other people out there, just like me! It was as if I was coming home. :) I met all these fabulous people who have the same interest in improving themselves, becoming the best they can be, and making all their dreams come true, just like me. Now that I’ve started my website, I get emails almost on a daily basis from others who have been to my site and can relate to my story or resonate with what I’m trying to do. I wish I would have started showing this side of myself sooner! Of course, you want to be careful in who you choose to start expressing yourself to, especially if you’ve made it a habit of hiding your true self from others your entire life. Not everyone is going to be comfortable with your new openness about who you are. You can start out with baby steps, though, and make larger strides as you go along. It's also especially important to remember that if you do allow others to begin seeing more of you and they react in a negative way, it's NEVER about you!! It's always about them, period. It's just an indication that they are not entirely comfortable with who they are yet, and are still hiding parts of themselves from others. Are there areas in your life where you could start allowing others to see more of who you really are? Part Four: Addicted to Perfectionism? What’s really interesting to me about this whole experience, though, is the connection I’ve found between wrecking the journal and being a lot cleaner than normal in my living space. I’ve been thinking about it a lot this past week, trying to figure out if there’s an explanation for it, and I think I’ve figured it out! Because I’ve been allowing myself to express my creativity through wrecking my journal, I haven’t felt the need to ‘express my creativity’ in my home. I’ve been making a mess in my journal, and therefore haven’t needed to make a mess in my condo. Wrecking my journal throughout this experience has given me “permission” to do things I normally wouldn’t do, like rip and burn pages, smear condiments on the pages, and write various things all over the pages. Normally I treat books with so much reverence that doing these things to a precious book is just unheard of! Throughout this experience, however, I’ve been allowing myself to break out of my shell and bust through the walls of perfectionism that are usually held around me very firmly in place. I think that by me leaving clothes and dishes lying everywhere around my condo (my normal routine) I am in a sense “rebelling” and showing the world that I don’t have to abide by the rules of keeping a clean house. I'm saying, “It’s socially acceptable to pick your clothes up off the floor and put the dishes in the dishwasher, but watch this! I’m going to leave clothes and dishes scattered all over the floor, and there’s absolutely nothing you can do about it!” I didn’t rebel much as a teenager, well not at all really, so I think this is my subtle form of rebellion. Since I’m enjoying having a clean place to live in and would like to keep it that way from now on, I’ve learned that I need some sort of creative outlet where I can regularly express myself however I want to. In essence, allow myself to make a mess so that I don’t feel the need to make a mess in my living space! I’m curious, has anyone else noticed that they’ve been more clean and tidy than normal while doing this experience?